The Furuno FM-8800 is a cost-effective all-in-one marine VHF radio system consisting of a 25W VHF radiotelephone, a DSC modem and a CH 70 Watch Receiver. It complies with GMDSS carriage requirements for safety and general communications. The FM-8800 offers simplex/semi-duplex voice communications on all ITU channels in the 156-174 MHz VHF band. Other standard features are Dual Watch and Multiple Watch functions that allow keeping a watch on CH 16 or another selected frequency. Full Class-A DSC functions are provided for distress alert transmission and reception, as well as the general call formats (Individual telephone, All Ships, Group and Area Call). Distress alert can be readily transmitted but an arrangement is provided to prevent accidental activation. CLX.4 is fiberglass marine VHF whip antenna operating in 142−165 MHz frequency band. The antenna has wide vertical radiation pattern and omnidirectional transmission in azimuthally plane. CLX.4 is suitable for any type of commercial vessels and can be mounted on any surface or mast onboard due to a number of mounting hardware options. The FS-1570 and FS-2570 are the new MF/HF radiotelephones for general communications and GMDSS applications. Provided in addition to radiotelephony, they also have a function of DSC (Digital Selective Call) on general communications and DSC Watch Receiver working on all the distress and safety frequencies in MF and HF bands. The FS-1570 and FS-2570 maintain a continuous watch on a distress call even while you are exchanging normal voice messages. DSC channels can be individually set or all the selected channels can be automatically scanned. When a DSC message is received, the radiotelephone gives the audible and visual alarms. The FS-1570 and FS-2570 work on all the authorized transmit frequencies between 1.6 and 27.5 MHz. Receiving frequencies are selectable between 100 kHz and 30 MHz in 10 Hz steps. The transmit and receiving frequencies can be selected separately or in pair. The digital frequency synthesizer provides high frequency stability for DSC and NBDP as well as for the telephony operation. The compact cabinet allows a flexible and space-saving installation in a communication console. Optional equipment includes a distress alert unit, received call unit, remote control unit and distress message control unit. In addition, a telex modem (NBDP) can be accommodated in the transceiver unit for the general message transfer and the distress message/maritime safety information handling, satisfying the carriage requirement in GMDSS A3- A4 sea areas. The Felcom-15 is FURUNO's Inmarsat-C Mobile Earth Station. It provides a high quality two-way telex and a data link between ships and other parties at sea or on land. All functions and services of the Inmarsat-C system are provided: EGC (Safety NET/FleetNET), distress message handling, two-way digital store-and-forward messaging including polling, data reporting, E-mail, etc. General data exchange, telex, etc. FURUNO NX-700 is a dual-channel NAVTEX receiver for SOLAS ships complying with the new NAVTEX performance standard MSC.148(77). The NX-700 can receive two channels simultaneously. Messages include a variety of safety information such as Navigational Warnings, Meteorological Warnings, Search and Rescue (SAR) information and other information for ships sailing within the reach of each service station coverage. The broadcast station can be selected automatically according to the ship position when the NX-700 is connected to a GPS navigator. The NX-700 consists of a receiver, a display with a printer and antenna units. The compact umbrella type antenna requires no grounding because it is H-field antenna. In addition, the antenna incorporates a high-performance preamp within the compact body, which gives a reliable and uninterrupted reception without an extra whip antenna. Entel HT644 Submersible Portable Marine Radio has been developed to offer a high level of durability and operational reliability, allowing it to be dependable in the most extreme conditions. It is approved by IMO (International Marine Organization) and has Shipping Register of Ukraine certificate. 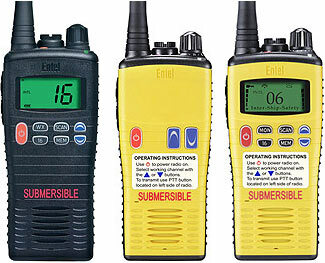 Entel HT649 VHF Submersible Portable Marine Radio is approved not only by IMO (International Marine Organization) as a communication means at a distress but also are intrinsically safe according to the certification of ATEX, that can be used on tankers, ships transporting explosive chemical material and liquefied gas. URANIS LTD has moved to the new building!!! PRO-5 EPIRB has been type approved by CCS (China Classification Society). The Certificate of type Approval for the URANIS BNWAS is received from Germanischer Lloyd.